If you look at what struck Russia in the outgoing year, (and these were incredible sanctions, provocations,) as a result, there were packs of lies and hostile disinformation, challenges to our defense capability, all sorts of pressure (I wouldn't like to recall it all the day before the New Year), we can't help being surprised how firm Russia has remained, and how strong our character is, and how much warmth is in our people. In our culture, there is an inexhaustible strength to overcome difficulties. Sometimes we create them ourselves. But we can laugh at this using our strength, and then get out of the mess with our heads held high. Meanwhile, Russia, even under the burden of external problems and our homegrown bumps in the road, remains a large island of normality and humanity in the world. Yes, we want to live better, but hate doesn't divide us, as it is now happening in the USA. Yes, we value our multi-ethnic culture, but we don't fall into crude nationalism, as is happening in Ukraine. We want to earn more and spend less, but we don't trash our cities, as has been happening in recent months in France. Yes, we behave confidently in the international arena, but we don't go to put shame on ourselves, as often happens to England. We got used to the fact that the traffic police in Russia became completely different very quickly and don't harass anymore. Our doctors achieve outstanding results. Our roads have become far better. We have a lower crime rate. Our tax authorities work in a delicate way. Our army has never been so valiant and strong as it is now. Life has generally become safer. We're beginning to travel around the country more, and even with some surprise discover a kind, beautiful, and cozy Russia. We're changing ourselves for the better. We already agree with each other more and are just more friendly. We've become dearer to each other. This is important, especially in difficult times. In Russia, the outgoing year was the Year of the Volunteer. But this is just the beginning. There are more and more people who help others and make our land cleaner for free. Thus, we're creating an environment where we'd like to live. I realize that my words sound more like a toast, but we're drinking less. And we should be able to say some things to each other without a glass of drink. 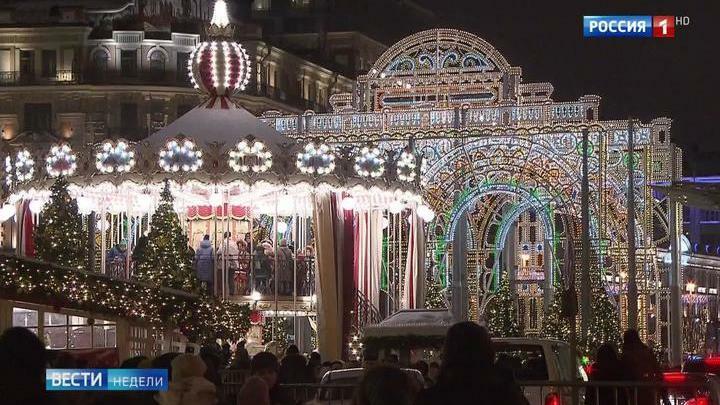 Olga Armyakova has the details on how Russia is going to celebrate the New Year. How can one not believe in a miracle, especially a bright, unusual, and welcome one, when we can already peek at the new 2019 and find ourselves in a New Year fairy tale on horseback. It's a dizzying journey through time, where anyone can feel like a child. Celebration knows no age. Of course, the main thing is impressions. There will be many different, but certainly joyful and unforgettable impressions. "Moscow impresses and surprises. Everything's great. The events are very bright". - I liked the jump-rope. After all, I made 44 jumps. - Did you set a record? "The holiday is like in my childhood. We want to feel like children again". As if by magic, thousands of lights light up. Even the Kremlin, or rather its copy, is made of multi-colored lights. It's a tourist attraction, too. Everything is ready for the grand tea party nearby. The menu has the most exquisite dishes. Maybe they aren't haute cuisine, but they're made with love. "Here's the sweet symbol of the New Year, which we make for you with love". One sees Moscow and falls head over heels in love with it. On the main streets of the capital, there are a fantastic carnival and an atmosphere of different eras, from the Soviet past to an incredible future. And in the frosty air, there are the smells of tangerines and cinnamon. They can't be mistaken for anything else. It's a holiday coming to us. The dazzling beauty is in the details. There are glittering crowns, charming ladies' fans, and mysterious masks here. It's an atmosphere of theater here. How could it be different when this is the Bolshoi? Of course, the Nutcracker, the main New Year's ballet, is on stage. "It's a fairy tale, a dream, and a New Year's atmosphere. The New Year starts for us now, from this day on". It's about time to make a wish under a shimmering starry sky. These days, everything is sure to come true. The important thing is not to freeze. Use a warmer. - It's a hand warmer. - Honestly, I like it, too. One can skate to melt the ice. Somewhere between Mars and Jupiter is the space skating rink on VDNH. What fun can be had without the traditional winter games such as sleigh rides? But don't do it for a long time, you can get dizzy. There are ice sides for speed lovers. Hold on tight! A festive mood sweeps the country. Even time seems to go by faster. We're going to a New Year's fair in Saint Petersburg in order not to waste time and manage to do everything in time. One can buy presents for everybody and please oneself with new clothes. Ushankas will never go out of fashion. What's more important, it'll protect you from the cold weather. The good old songs will warm one's soul. "Why aren't you, silly, Sleeping yet? And here are the fireworks in Kazan. This is the rehearsal of the celebration. Don't get lost in the glowing tunnel. We're heading to the New Year's capital. There is no Emelya on the stove because it's too cold. In Tula, they have their own fairy tale, where skilled craftsmen and artisans meet guests. "Welcome to the residence of Lefty!" The hot forge will make even the coldest heart melt. And Tula Lefty will surprise the entire world once again because this snowflake will never melt. Tula is a true hostess of the holiday party. It's never been decorated better. There are endless strings of garlands and bright decorations. And how could they do without the main beauty? Raise your head up to see all of it. It's shimmering, playing songs, and meeting guests with treats and games. "The atmosphere of Tula is so great. It's so soulful, good, and beautiful. We're in love with it". "I don't feel cold. The music is great, so we want to dance". It's impossible to just stand still. The Russian folk songs will make you dance. Of course, one shouldn't bring one's own samovar to Tula. It's not needed because there are so many different samovars that one couldn't count them. This is a royal one, which means that the tea from it is sure to be tastier. Of course, there will be a Tula pryanik for dessert. It's fresh from the oven, still hot, and always delicious. We'll add bright colors ourselves. And may this New Year be happy! Olga Armyakova, Konstantin Morozov, Vladimir Averin, Vladislav Mirzoyants, and Semyon Shapchenko for Vesti Nedeli.